After 6 months of planning, it is wonderful to finally be in MonarchLand. The weather was perfect when we landed, mid 70’s. We were greeted by our Craftours rep Pam Holland, who put us on a van and off we went, while she stayed behind to welcome the next group landing at a later time. We felt very safe meandering downtown. 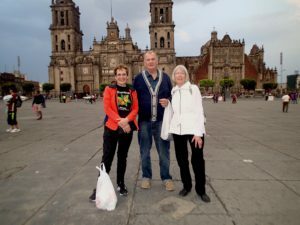 ​Although I was tired from our 5:15 wake up time, my partner Audrey and I, and our two new friends Walt and Janice from Dallas, immediately started our first mission: to buy paint and other art supplies to take to the families in Macheros and Zitacuaro. Last year, we set up the former to paint monarchs on rocks to sell to tourists. Save Our Monarchs jumped in to offer them on their website, saveourmonarchs.org, where several hundred were sold. Most of these kids had never had a paintbrush in their hand, and now, their work is excellent, theyenjoy school more, they have money in their pocket, and money for the school. This week, we will introduce rock and Christmas ornament painting to a new group of families in Zitacuaro, near the El Rosario and Sierra Chincua monarch sanctuaries. The half hour walk to Fantasias Miguel (sounds like Michael’s, no?) was quite an adventure, a mix of old and modern shopping and buildings, with pedestrian only boulevards. With funds from Save Our Monarchs, generated from previous rock sales, we stocked up on acrylic paint, brushes, sealer, and ribbon, and staggered back with it to our oh so gorgeous Hilton Hotel, conveniently located right in the heart of the action. ​I am excited to present the new supplies to the kids and adults in Macheros, especially the gold metallic paint, which the kids can use to add the final touch of realistic detail to their chrysalids. We met the rest of our Craft Tours group for dinner at our hotel.How fun and interesting to meet monarch and craft afficionados from all over the county. At dinner, I gave a copy of my book (How to Raise Monarch Butterflies A Step-by-Step Guide for Kids), to everyone. ​The extensive buffet breakfast at the Hilton was a beautiful way to start the day. We headed to Metepec. Our guest guide the one and only Estela Romero, ace reporter for Journey North, pointed out the sites on the way, so we didn’t notice the crazy Mexico City traffic for quite a while. We didn’t have as much time to explore the craft market as we had hoped, but it was different and interesting. We are with people who go with the flow; monarch and craft people are so wonderful. I picked up a few monarch treasures, which I will post when I get a chance. 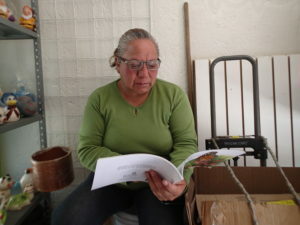 And I outfitted a vendor with her first pair of reading glasses. She was thrilled! We arrived in Zitacuaro, our jump off point for the sanctuaries, to a perfect dinner where we unwound for the day. Our rooms are stunning; the service, first class. Tomorrow, Sierra Chincua, with good weather! This shopkeeper was thrilled to get glasses! 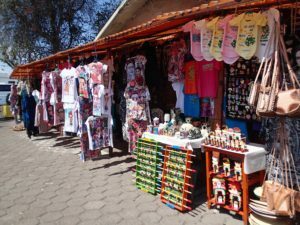 Browsing the craft market in Metepec. You better like tortillas, cheese and beans if you go. ​​After our gourmet breakfast at the luxurious Rancho San Cayetano, we headed for our first monarch sanctuary. Our fabulous guide, Estela Romero, reporter for Journey North, educated us on Mexican culture, and agriculture, along the way. I hope you meet her one day. She is a real gem. ​The sun was shining when we arrived at Sierra Chincua. We practically had the whole place to ourselves. Four of us decided to walk instead of taking a horse. Hey, we’re fit! Fortunately, the guides were smarter than we were, and followed us with a horse. Within 5 minutes, we had all caved! We stood in awe watching the monarchs roosting and in flight. I was so excited to get some shots good enough to put on the wall. 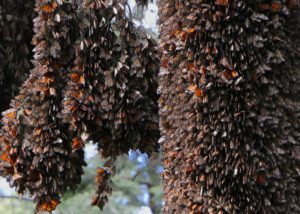 The experience was moving and breathtaking; thousands and thousands of monarchs covering the branches and tree trunks, coming and going and jostling for position. ​We are grateful to Save Our Monarchs for initiating this trip through Craftours. One cannot help but have a deep commitment to saving our monarchs after seeing what we saw today. ​Today was another incredible day. We went to Macheros, to revisit the kids whom last year we taught to paint the MexiRocks that Save Our Monarchs has been selling on their website. (saveourmonarchs.org). We started of with a challenging hike to get a glimpse of the insides of some of the houses. What an eye opening experience! One of the students, Octavio, was proud to show us his home on the hill. His farm has four ‘bunkies’, which were not more than shacks. Some had a proper roof, the others, hard plastic. None had electricity, windows, or any kind of light other than candles. Makes it hard to do homework at night! There was no central place for the family of 11 to gather. The two eating areas could seat only 5 or 6 at a time. Yet it was all well kept and pretty. The only two men worked as labourers in a nearby town. There were lambs, and chickens which were slaughtered by Octavio’s mother for food. One of his aunts was washing clothes by hand, as most people do, including our guide Estela. After lunch many of us went to watch the kids painting, while the others walked down to the trout farm. There have been many times where the group has split up according to their interests. How far the kids have come! 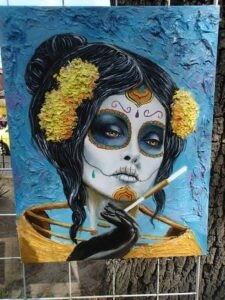 Their work is gorgeous: I can’t wait to post it when I get home with better internet. And they have a beautiful display case for their work; we were practically fighting over the rocks. We made it back to our hotel to teach a new group of kids and adults how to make and sell their art to tourists. I have a fantastic team with me who got everyone started with a craft while Audrey and I brought up loads and loads of art supplies. When we got there, our friends were teaching Christmas ornaments with punched out monarchs, pom pom caterpillars, and completing the most stunning canvas bags! That gave us time to set up the painting of rocks, which first had to be washed and dried by our team. We covered the tables with plastic and laid out all the materials. We were shocked by the quality of the work. Wait till you see what the five year old did! The hotel owner’s daughter-in-law, a talented crafter herself, agreed to take all the supplies, and make opportunities for the kids to come back and paint more. I suspect she even has a way to sell them, although Save Our Monarchs has already agreed to help get them started by selling them on their saveourmonarchs.org website. While the painting was going on, team members outfitted at least 10 ecstatic people in prescription eye glasses! Once again, this is the highlight of the trip. Especially thrilling was the 80 year old woman who looked around, back and forth, in sheer delight! But most of the prescription glasses went to younger people who will really use the glasses to function and earn their living. Thanks to Eyes on Sheppard for their help with the eyeglasses, and their gifts of eye glasses cleaning supplies. At the end, though we almost forgot, we took out gifts for everyone. The adults went most wild over the shoes, donated by Running Free. The kids loved the colouring books, paints, crayons, pencil crayons, and especially the stuffed animals, which my mother picked up (and washed if necessary), from the flea market in Ft. Lauderdale. Truly a most successful day! After visiting Sierra Chincua two days before, and hearing that El Rosario was even better, anticipation was high. While half the group took the horses, I joined the walking group. The path was hard packed, or stairs; quite doable at a slow pace. The weight of the 300mm borrowed lens, camera, and new tripod, just about put me over the edge, until I asked our El Rosario guide if I could pay him to carry it. I was a new person. I scampered to the top and was delighted that all the equipment worked. Next time, more practice! We were surrounded by monarchs in clusters swaying in the wind, then still. Clusters were right over our head. Then the sun came out, and thousands burst from their clusters into a magical dance over the path between the trees. We had a delicious bagged lunch with us, so we could really take our time. On the way back to the bus we finally had some time to buy absolutely gorgeous and inexpensive Mexican crafts, like sweaters, hats, and embroidery. 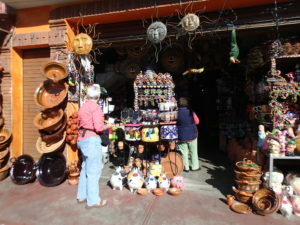 It is really fun to shop when most of the souvenirs are locally made, and cost so little. And it means so much to the local population, which has only a short season to make some money from the forests they protect. We headed off to Angangueo for our cooking lesson and dinner at the home of our guide Estela Romero. Two well qualified cooks, under the supervision of Estela’s mother, showed us how tortillas were made, both by hand grinding the corn, and as well with a hand turned grinder. Did you know that the only ingredients in their tortillas is native blue corn and water? We watched as the cook pan heated the chilis until they were brown, then peeled and stuffed them with either beef, tuna or cheese filling, then floured, battered and fried them, before simmering them in a seasoned tomato sauce. It was the best meal I had! Served with rice and beans (what else? ), along with pulque for the adventurous, and finished off with various candied fruits. We even got a tour of Estela’s home, the history of which was fascinating. By this time, we all loved Estela, so it was so wonderful to learn more about her and her family. I have to be honest with you. I didn’t get very excited when I heard we were going to be visiting a botanical garden with stained glass windows, but I was blown away by dozens of floor to high ceiling creations that told a story. What a delightful quick stop on the journey back to Mexico City from Zitacuaro. We even did a quickie at the market there; so interesting, so inexpensive. 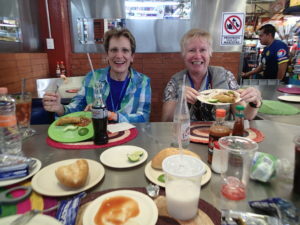 On arriving in Mexico, we dined at a traditional mexican restaurant, complete with musicians. This was followed by what some participants said was the best walking tour they had ever experienced. Each person was outfitted with a head seat, which allowed them to hear the new tour guide perfectly without ever stopping to ‘gather round’. And while most had seen the inside of dozens and dozens of churches, this one was particularly stunning and different. A few opted to do their own thing. Audrey and I decided to visit the huge market right outside our Hilton Hotel downtown! I only wish I had been hungry for the wide variety of innovative street food. Once again, we saw brand new crafts, including pine needle art. I believe we paid about $12 for this work, composed of more than 500 pieces of died needles, which we watched this woman break onto the sticky, beeswax backing. Spray paint & garbage art. You may have seen artists working with spray paint, bottle caps, and scraps of cardboard. Usually they wear masks. We liked this man’s work, and asked him his price: 35 pesos. I asked him to repeat that; surely I misunderstood. Nope. 35 pesos. $2.32 Canadian. I watched his creation explode, and just had to confirm his price, which I am a bit embarrassed to say I paid him. Next year, I’ll add a tip. We preferred a slight adjustment to the painting you see; I asked him to take out three cacti, and add a dead tree which I saw in another painting. Then presto, it was done, exactly the way we wanted it! I studied Spanish in high school, then in university, just for fun, then didn’t use it for more than 30 years. Before the trip, I brushed up, with CD’s in the car. I used my Spanish all day every day. I felt like a hero translating for others, and I loved solving my own problems, like telling the guy at the restaurant that we didn’t need to eat on the patio, and would eat absolutely anywhere as long as there were 3 seats together. We had the best time at a counter, eating with the locals, and ordering by pointing to what they were eating! Honey dripping form the comb! We started the day back in our gorgeous downtown Hilton hotel, with its never ending buffet breakfast:custom omelettes, fresh figs, a fruit bar where the chef cuts it just for you, a decadent assortment of breads and pastries, fresh exotic fruit juices, all kinds of veggies and gluten free, various mueslis, yoghurt, cereals, well, you name it. It was a free day, but most of us opted for the excursion. It started with a crazy fun boat ride. Imagine a canal crammed with a hundred identical flat bottom bumper boats, that are steered gondola style with just a pole. Mexicans rent them for an hour or two for picnics! As we were about to launch, a vendor jumped on our boat, and we vultured through her collection of necklaces. When we were shopped out, she stayed on to string more. In the meantime, a different jewelry seller boarded, and off we went again. Other vendors linked to us, displaying all kinds of goods. How fun! There were three boats of tuxedo clad musicians, who, for a small fee, would play your favourite song, just for you. On debarkation, we picked up our last minute souvenirs, and headed off for a guided bus and walking tour in the older part of town. We ended our day with a farewell dinner at our hotel, where I gifted everyone with three of my home made photo cards. The fun part was that everyone got to trade with the others, between courses, in order to wind up with their favourites. Again between courses, we took turns talking about person highlights of the trip. ​It’s not every trip that has a company rep, a local guide, and a monarch expert. We worked together to provide the best possible experience. We made mistakes, and learned from them. Many times, we were able to split the group into two according to their preferences. Next year, we depart February 25 for eight days, sponsored again by Save Our Monarchs Foundation. Grabbing a bite with the locals.